A drive to help raise $5 million and save the accreditation of Bennett College received a boost this week as donations began to pour in ahead of the Friday, Feb. 1 deadline. The Papa John’s Foundation and the Z. Smith Reynolds Foundation of Winston-Salem, each pledged a $500,000 donation to the school, and each said they will recruit additional donors. The pledges increased the overall total raised to date to $2.7 million– a little more than half of the $5 million needed. 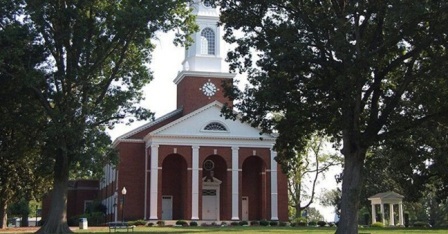 “Bennett College has an outstanding tradition of academic excellence for African American women,” said Dr. Benjamin F. Chavis, Jr., president and CEO of the National Newspaper Publishers Association, the trade organization that represents 215 African American-owned newspapers and media companies around the country with more than 21 million weekly subscribers. “The college is funded by the Presbyterian Church and my great-great-great grandfather, the Rev. John Chavis, was the first ordained African American Presbyterian minister in the United States, and so I appeal to all Presbyterians, to all Episcopalians, to all Methodists, to all Baptists, and to those of all faiths, to help save Bennett College,” Chavis said. The privately-owned four-year historically black liberal arts college for women that’s located in Greensboro, was founded in 1873 as a school to educate recently freed slaves and train both men and women as teachers. An integral part of its community since its founding in 1873, Bennett transitioned into a women’s school in 1926. Reduced enrollment levels in recent years have sapped the college’s coffers, resulting in budget shortfalls and placing Bennett at risk of permanently losing its accreditation. Students, alumni and others associated with Bennett have developed a websitewhere donations can be made and information about the college can be found. Using the tagline and hashtag, “Stand with Bennett,” the group also presents evidence that Bennett has made significant gains in addressing its financial stability over the past two years. Bennett generated a surplus of $461,038 and had no audit findings. Bennett was approved for a capital loan deferment over a six-year period with a financial benefit of nearly $9 million. Bennett has steadily increased its fundraising from $3.47 million to $4.25 million over a 3-year period. Bennett’s enrollment has been trending upward for 2 years from 409 in 2017 to 471 in 2018. The college’s retention rate is significantly up from 44 percent in the Fall of 2017 to 53 percent in the Fall of 2018. The average GPA of new freshwomen increased from 2.8 in 2017 to 3.2 in 2018. Bennett continues to support mission activities, and academic and student programs. The Editorial Board of the college’s local newspaper, the Greens­boro News & Record, said Bennett is raising the money as a show of good faith to an accrediting agency that the college is working, urgently, to address its fragile finances. That agency – the Southern Association of Colleges and Schools Commission on Colleges – has threatened to revoke Bennett’s accreditation because of the college’s tenuous fiscal footing. Bennett plans to appeal that ruling in mid-February and began the quick-strike campaign to help make its case, according to the Greensboro News & Record. Without accreditation, Ben­nett would lose eligibility for federal grants and student loans and could be forced to close.